Not every business has a board of directors. 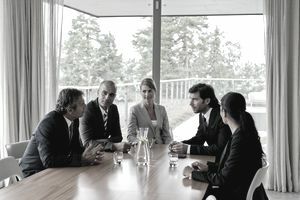 Corporations are required to select a board of directors to oversee the company, but other types of businesses are not required to have board members. That being said, it's always a good idea to get good, knowledgeable people to help you get started and run your business. If you are starting a corporation you will need to select a board. Your board members will help you make decisions and also satisfy the requirements of the state in which you are incorporating. Here are some things to think about before you select board members. How Many Board Members Should There Be? First, select an uneven number of board members, to avoid ties. The number of board members depends on the size and complexity of the organization. For a small organization, five to seven people are plenty. For a larger, more complex, organization with several committees, you might want 9 to 11 people at the minimum. You need enough people on your board so that, if several people are not present, you can still have enough to make a decision, and for a quorum. But too many board members can slow down any meetings and progress. What Does a Good Board Member Look Like? Expertise in a specific area which can help your corporation. For example, many corporations include an attorney and a financial advisor on their boards. Leadership and management experience, especially in related businesses. For example, if your business is in a technical area like computers, you should have people who do business in that area. They know others who can help you, and they understand the specifics of the management and operation of the business. Commitment to the business. Board members must be interested in the business and its continued well-being. They should not be serving just for the money or for personal interests. You don't want to have to pay your board members. Time and energy to devote to board duties. Board members will be expected to spend time preparing for and attending board meetings and to serve on additional committees. Integrity and lack of a conflict of interest. Board members will need to sign a conflict of interest statement, and they must act in the best interest of the business, not their individual or business interests. For example, a board member who profits from his or her service on a board of directors may put the entire company in jeopardy. Ability to raise money for the corporation. Your business can have a significant advantage if you select one or more board members who have experience raising capital for business startup or expansion. Don't select someone just because they are a friend or relative. Don't select someone who hasn't been checked out thoroughly. Do a background check, get references. Don't select anyone who has a conflict of interest or potential conflict of interest. Of course, each type of small business needs specific kinds of people to serve on its board of directors. But all businesses need individuals with integrity, commitment, and interest as board members.